Did Owners Collude To Keep Him From Playing Or Did All The Owners Happen To Individually Decide To Keep Him From Playing? The NYT and other news sources report that arbitrator Stephen B. Burbank denied the NFL's motion for summary judgment in its dispute with Colin Kaepernick. For now, Kaepernick can proceed with his grievance against the NFL. Kaepernick, of course, is now famous as the quarterback who initiated the wave of kneeling during the national anthem to protest police brutality and racial inequality. He became a free agent in March 2017, after which he has faced protracted unemployment. He is represented by famed litigator Mark Geragos. Majority Remands So That Quantum Meruit Recovery Can Be Considered; Dissent Believes Neither Contractual Nor Quantum Meruit Recovery Should Be Awarded. Dear Readers, as we approach the three-day Labor Day Weekend, which I hope each of you will enjoy, I would like to spare your having to read a California Supreme Court majority slip opinion that is 43 pages long, followed by a dissent that is 30 pages long. However, if you want to read the majority opinion and the dissent too, just click here. Sheppard, Mullin, Richter & Hampton v. J-M Manufacturing Company, Inc., S232946 (Sup. Ct. 8/30/18) (maj: Kruger, Corrigan, Liu, Cuellar, Nares) (dsst: Chin, Cantil Sakauye, C.J.). The law firm represented J-M Manufacturing Company, Inc. in the defense of a federal qui tam action. It also represented South Tahoe Public Utility District, one of the parties suing J-M. The law firm also obtained conflict waivers from the parties, without, however, disclosing to the parties that it represented their opponents in other matters. A fee dispute arose between J-M and the law firm. The fee dispute was sent to arbitration, and the arbitrator awarded fees on the contract to the law firm. The superior court confirmed the award. However, the Court of Appeal reversed, holding that the law firm was precluded from obtaining contractual fee recovery because of its failure to disclose the existing conflict. I blogged about the Court of Appeal opinion on January 31, 2016. The Supreme Court majority, as well as the two dissenters, agreed that the Court of Appeal was correct to deny contractual fee recovery based on the undisclosed conflict. However, the majority remanded for consideration of the possibility of equitable recovery in quantum meruit, whereas the dissenters would have held that the disqualification from fee recovery should be total. Arbitrator Did Not Exceed Powers By Abridging An Unwaivable Statutory Right Or Policy. One of the grounds for a court to vacate an arbitrator's award is that the arbitrator exceeded his or her powers. See Code of Civ. Proc. section 1286.2(a)(4). And arbitrators may exceed their powers by issuing an award that violates a party's unwaivable statutory rights or that contravenes an explicit legislative expression of public policy. Richey v. AutoNation, Inc., 60 Cal.4th 909, 916 (2015). In Branches Neighborhood Corporation v. CalAtlantic Group, Inc., G055201 (4/3 8/24/18) (Moore, O'Leary, Fybel), the defendant/respondent developer obtained summary judgment in arbitration, because the HOA filed its arbitration demand without first following a requirement in the HOA's CC&Rs requiring it to obtain the vote or written consent of 51% of its members prior to initiating a construction defect claim. The HOA tried to correct the problem by ratifying its decision to arbitrate after the fact, but the arbitrator wasn't having it. You could say this is a case that depends upon the plain language of the CC&Rs. That, by the way, is what the Court of Appeal said. The Court could not find an unwaivable statutory right to ratify after the fact what the CC&Rs required the HOA to do prior to filing its arbitration claim, nor could the Court find any express public policy that prevented enforcement of the CC&Rs. "[A]ccordingly, the plain language of the CC&Rs controls." Affirmed. The Security Agreement Included An Arbitration Clause, But The Purchase Agreement Did Not. It is not unusual for a consumer to execute more than one agreement at the time of purchase, only one of which contains an arbitration clause. Such was the case in Fuentes v. TMCSF, Inc., E066242 (4/2 8/23/18) (Ramirez, Slough, Fields). Fuentes, who bought a Harley-Davidson motorcycle, and Riverside Harley-Davidson (Riverside) were parties to a purchase agreement without an arbitration clause. Fuentes and Eaglemark Savings Bank (Eaglemark) were parties to a simultaneously executed Security Agreement that did contain an arbitration clause. When Fuentes sued Riverside in a putative class action, Riverside petitioned to compel arbitration. Cases like this present a standard set of questions: are the two agreements to be interpreted as a single agreement? Is the party seeking arbitration (Riverside here) an agent of the party (Eaglemark) to the contract with the arbitration provision? Does the party seeking arbitration have standing as a third-party beneficiary of the contract with the arbitration provision? Is the non-signatory plaintiff equitably estopped from refusing to arbitrate because he asserts claims "inextricably intertwined with" the underlying contractual obligations of the agreement containing the arbitration clause? To which the Court of Appeal answered, no, no, no, and no. AFFIRMED. We suspect that in the future some drafting changes will be made by Riverside to its sales documents. 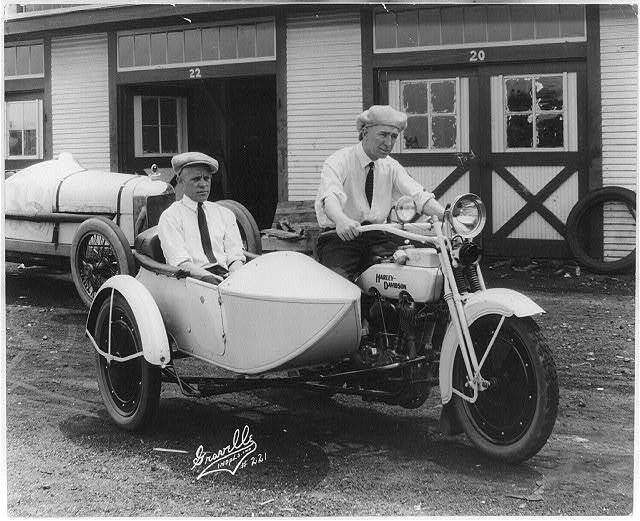 Above: Jimmy Murphy, winner of 500-mile auto race at Indianapolis, Ind., May 30, 1922, and Ernie Olson, mechanic, seated on Harley-Davidson motorcycle and in sidecar. Library of Congress. Henry Schein, Inc. v. Archer & White Sales, and Lamps Plus v. Varela. On August 20, 2018, Amy Howe reported in SCOTUSblog that the Supreme Court will hear oral argument (Nov. 7) on two cases involving interpretation of the FAA. She reports: "Henry Schein, Inc. . . . asks the justices to decide whether the act allows a court to decline to enforce an arbitration agreement that gives the arbitrator the power to decide questions about arbitrability if the court believes that the arbitrability claim is 'wholly groundless.' . . . . [I]n Lamps Plus the court will consider whether the act bars a state-law interpretation of an arbitration agreement that would allow class arbitration, even when the agreement itself does not mention class arbitration." "Partial Final Award" Did Not Constitute An Award Immediately Reviewable By Superior Court. Maplebear, Inc. v. Donna Busick, No. A151677 (1/2 8/21/18) affirms the trial court's order dismissing Maplebear's (Instacart's) petition to vacate an award, which award was dismissed for lack of jurisdiction. Instacart is a same-day grocery delivery service, and the dispute arose when an employee, Busick, filed a class action arbitration demand with JAMS, alleging Instacart violated California law by misclassifying employees as independent contractors. The arbitrator issued a "partial final award" determining that the parties' arbitration agreement permitted Busick to move for class certification. Instacart petitioned to vacate the award. The trial court denied the petition to vacate, and Instacart appealed the denial of the petition to vacate. The opinion, which is a great refresher of the procedural steps involved when appealing an arbitrator's order, is interesting for a number of reasons. First, it treats the order denying the petition to vacate as an order dismissing the petition to vacate. This is important, because the relevant statute allows an aggrieved party to appeal from an order "dismissing a petition to confirm, correct or vacate an award." A denial is not the same as a dismissal -- except that by case law, denials may sometimes be treated as dismissals, making them appealable. Second, the Court concludes that the ruling in Mid-Wilshire Associates v. O'Leary, 7 Cal. App. 4th 1450 (1992), where the Court of Appeal "declined to construe a trial court order 'denying' a petition to vacate as a dismissal" does not survive Law Offices of David S. Karton v. Segreto, 176 Cal.App.4th 1 (2009) and and Cinel v. Christopher, 203 Cal.App.4th 759 (2012). Third, the Court holds that the trial court properly dismissed Instacart's petition to vacate the "partial final award" because the trial court lacked jurisdiction over a partial award that did not determine "all the questions submitted to the arbitrators the decision of which is necessary in order to determine the controversy." Cal. Code Civ. Proc., section 1283.4. Fourth, the Court rejected Instacart's argument that because the parties agreed that the arbitrator had no "power or authority to commit errors of law or legal reasoning", the trial court could immediately review the partial final award allowing Busick to move for class certification. Senate Bill Requiring Disclosure Of Confidentiality Restrictions Is A Compromise That Does Not Require Loosening Of Confidentiality Restrictions. As a consequence of California's Evidence Code provisions, and the California Supreme Court's decision in Cassel v. Superior Court, 51 Cal.4th 113 (2011), mediation confidentiality prevents a party to a mediation from using confidential information obtained in the mediation to sue his or her attorney for alleged professional negligence occurring at the mediation. Senate Bill 954, which is expected to soon become law, will require attorneys, except in the case of a class or representative action, to explain mediation confidentiality restrictions to their clients to a mediation or mediation consultation and to obtain written acknowledgment from the client that he or she has read and understands the confidentiality restrictions. After seemingly endless debate about whether confidentiality restrictions should be loosened to allow clients to use information obtained in mediation to sue their attorneys for malpractice, Senate Bill 954 can be viewed as a compromise or perhaps a way to finesse the issue. It doesn't change the existing law concerning restrictions on confidential information obtained in mediation. Nor does it expand the client's rights. By requiring the client's written acknowledge that the client has read and understands the restrictions, Senate Bill 954 simply makes the client aware of the restrictions, resulting, hopefully, in informed consent. And if the client is really unhappy with the restrictions on the use of confidential information, the client can (theoretically, perhaps), choose not to mediate. The Senate Bill includes safe harbor language that will constitute adequate disclosure. Attorneys and mediators might want to take a look at the safe harbor language now, and even begin using it. Evidence Code section 1129(d) would contain the safe harbor language, and that proposed language can be viewed by clicking the link to Senate Bill 954 above. Arbitration, Celebrities: Trump v. Omarosa Celebrity Wrestling Match, Round 1, Arbitration? I have received a confidential television script from a disloyal former staff member of the White House. In episode 571 of the long-running reality show, “Raging Dumpster Fires At 1600 Pennsylvania Avenue,” the courtly, urbane and impeccably mannered DJT and the villainous Omarosa Manigault Newman (OMN) grease up for a wrestling match in the ring. But this soon turns into a cat fight, with DJT and OMN trying to scratch out each other’s eyes. DJT calls OMN “a dog” and “crazed low-life” and OMN calls DJT “unhinged” and a “racist”. OMN smacks DJT with a rolled-up copy of Forbes. And as everyone by now knows, DJT, who is a germaphobe, and has a long history of using canine insults, has an intense dislike of dogs, being the first president in a long time, perhaps the first president ever, not to have a White House First Dog. The match seems remarkably even, given DJT’s little paws, and OMN’s sharp nails. Is this truly a made-for TV reality show, or is this a telenovela, complete with betrayal, infidelity, and violent emotion? Alas, those attributes do not help at all to distinguish between the TV reality show and the telenovela. Is this rotten script believable enough to be accepted even by a tasteless TV show with tabloid standards? To ask the question is to answer it: of course. Where in the world is this post going? Oh yes, Team DJT has filed with the AAA to enforce a non-disclosure agreement (NDA) in arbitration in New York. And if, as Politico reports, the enforcement proceeding has been launched by the Trump for President Campaign, based on OMN's release of her book Unhinged, what impact, if any, will this have on confidentiality during the time in the White House? We previously had some fun posting about Team DJT’s efforts to enforce an NDA with Stephanie Gregory Clifford (Stormy Daniels) in the privacy of arbitration, where dirty linen is not to be aired in public. I will not begin to opine where the latest fight between DJT and OMN is destined to end. Badly, is my best guess. What does the NDA say? Which one will apply, an NDA for the Apprentice? For the campaign? For the White House? What remedies does the NDA provide, and will they be found to be enforceable? Did OMN have a security clearance requiring pre-publication review of any writing that might contain classified information? Will OMN be able to obtain the legal firepower necessary to carry on a legal battle? Will the anti-matter DJT, Michael Avenatti, now step forward and represent her? Will she be able to successfully stake out a position as a whistleblower? Is there a written rule or statute that prohibits taping a conversation in the Situation Room? Were OMN’s tapes recorded in Florida (where both parties must consent to taping) or in Washington D.C. (where taping can be done unilaterally)? Does one have a reasonable expectation of privacy if taping can be done unilaterally? Are there considerations of public policy and freedom of speech that militate against using a private NDA to ensure confidentiality in the White House? Have other White Houses routinely required staff members to sign NDAs? Will parallel court proceedings be filed, resulting in a public airing of grievances and naked transparency? And even if the matter can be forced into arbitration, will the cat be out of the bag, so to speak, with so-called confidential information no longer confidential? I plan to consume many bags of popcorn while I sit back and watch the hideous show. BONUS: For a serious discussion of OMN's free speech rights in this kerfuffle, see Bradley P. Moss's article published August 14, 2018 in Lawfare, entitled "Why the White House Can't Stop Omarosa Manigault-Newman From Talking." Plaintiff Waived Vacatur Right As To Ethics Standard 12(b), But Did Not Waive Rights To Vacate Based On Arbitrator’s Failure To Make Required Disclosures Under Ethics Standard 7(d). Honeycutt concerned an employment arbitration by plaintiff/claimant against her former employer which was a defendant/respondent after employer successfully moved to compel arbitration in the filed lawsuit. In a California arbitration, an arbitrator must make certain statutorily-mandated and ethically-mandated disclosures to the parties, including Ethics Standard 7 [whether the arbitrator is serving as a neutral arbitrator in another prior or pending case involving a party to the current or a lawyer for a party] and Ethics Standard 12 [whether the arbitrator will entertain offers of employment or new professional relationships in any capacity other than as a lawyer, expert witness, or consultant from a party or a lawyer for a party, including offers to serve as a dispute resolution neutral in another case; and, if so, disclose the offer and acceptance in each case within 5 days of same]. The facts were that the arbitrator filled out the AAA disclosures, but there was a missing page where the arbitrator checked he would entertain other offers even though one of the other pages actually sent to the parties did have a handwritten explanation to the missing question that he would entertain offers to serve as a dispute resolution neutral in other cases and would evaluate any potential conflict at that time prior to accepting each offer. However, the arbitrator failed to timely disclose that during the pendency of the Honeycutt arbitration, he had been appointed to serve as an arbitrator in eight other employment cases involving counsel for Chase and two others (one being an employment case) involving Chase—with the parties only receiving four of the eight letters concerning employment cases involving counsel for Chase before the arbitration was completed. Importantly, an arbitrator has a continuing obligation to make required disclosures all along the way. After Honeycutt lost the arbitration, the AAA administrator sent the missing page and all 10 letters about the other cases involving the Honeycutt arbitrator. Honeycutt’s counsel sent AAA a disqualification demand based on the belated disclosures. AAA advised Honeycutt that the arbitrator was not disqualified, with a zero award to Honeycutt and each side ordered to bear administrative fees and arbitrator compensation/expenses “as incurred.” Honeycutt moved to vacate the award (given that arbitrator nondisclosure is a mandatory basis for vacatur under CCP § 1286.2(a)(6)(A)), but the trial judge confirmed it instead, finding sufficient disclosures and no prejudice. The 2/7 DCA panel reversed and ordered that the award be vacated based on the arbitrator’s failure to make disclosures under Standard 7(d) [other cases involving Chase’s counsel or Chase]. With respect to the failure to make the Standard 12 disclosure, the appellate court found Honeycutt waived her right to vacate on this basis; after all, she failed to object although knowing about the missing page and knowing about the handwritten disclosure such that it was unfair for her to delay raising the issue until after she lost the arbitration. Different matter, altogether, with respect to the Standard 7(b) nondisclosures. Even though a vacatur requires that the arbitrator has actual awareness of a ground for disqualification, the panel found he had to in light of the fact that he was a participant in the other cases. The appellate court questioned whether an arbitrator, unlike an attorney, can blame a case manager, assistant, or secretary for an arbitrator’s failure to comply with the Ethical Standards, given that the arbitrator has actual awareness of his own intent to entertain offers of employment and then to accept them—which triggered disclosure obligations. Honeycutt did not waive this right to vacate, because it was a right she did not know she had, with her counsel moving to disqualify the arbitrator well within the 15 days required to object after receiving the AAA case manager’s letter finally disclosing everything. So, the rivers of justice in this one swept the arbitration award down the river and out to sea so that an arbitration can take place before an arbitrator making all required disclosures. Honeycutt also was awarded her costs on appeal.